D’Appolonia provides a wide range of design services related to foundations and earth retention structures. Projects where these types of services are provided frequently involve develop-ment of innovative designs using specialty construction techniques to provide cost-effective construction solutions in difficult terrain or in conditions where conventional solutions are unattractive. Our engineers are familiar with a wide variety of specialty construction techniques and routinely perform analyses and prepare designs for owners and specialty contractors. 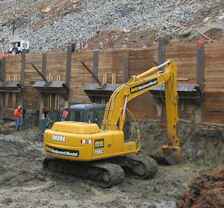 Many of these projects involve remediation of failed or failing slopes in extremely difficult soil and rock conditions. We are familiar with the design and construction requirements for a wide variety of specialty construction techniques. Brief descriptions of our capabilities in the areas listed above are provided in the following paragraphs. More detailed discussions of individual topics can be accessed by clicking on the links provided. The design of foundations for structures such as buildings, bridges, and roads is a common element of our professional practice. We are familiar with the design of all types of spread footings, mats, and deep foundation systems (driven piles, drilled shafts and micropiles). The use of a particular foundation type is a function of the subsurface conditions at a site. Conditions such as the presence of soft compressible material at the surface or highly variable support materials typically guide the selection of the type of foundation system to be employed. Sometimes it may be desirable to improve foundation conditions by modifying the surficial materials. Some examples include dynamic consolidation (dropping a heavy weight to consolidate the soil), stone columns (densification of surface materials using vibratory methods with gravel backfill) and soil mixing (mixing of soft soils with coarser material using multiple augers). D'Appolonia has applied these techniques and others to improve site foundation support conditions. Our familiarity with soil improvement techniques enables us to select an effective technique based upon technical feasibility and cost. We routinely prepare designs that employ soil improvement techniques, and we prepare related plans and specifications and monitor construction activities. Deep foundations are required in situations where high foundation loads cannot be supported by spread footings on soil. Deep foundation options include driven piles, drilled shafts and micropiles. Driven piles are frequently located close together in groups with the tops connected by a concrete cap that supports the structural load. In many situations driven piles are not attractive due to the presence of subsurface obstructions to pile driving or environmental problems with driving piles such as noise and vibration. Drilled shafts can be constructed with large diameters sometimes eliminating the need for a pile group connected by a cap. Micropiles, which are sometimes referred to as minipiles or pin piles, have gained substantial acceptance in recent years. In application, multiple micropiles are used to replace a driven pile group or a larger drilled shaft, particularly in karstic or difficult to drill geologic conditions. Much higher stress transfer per unit area can be achieved with micropiles, and they can be installed in restricted spaces where other solutions may not be feasible, or where hard rock conditions inhibit economical advancement of larger shafts. D’Appolonia is experienced in the design of all types of deep foundations and is familiar with the situations in which each type is advantageous, both from a technical and economic standpoint. Development of a site in sloping or uneven terrain typically requires that the site be graded to accommodate the planned construction. This process frequently leads to the need for analysis and design of temporary and permanent site slopes and, where space is limited, the design of retaining structures. D'Appolonia is skilled in the analysis of slope stability, and our staff understands the importance of determining key strength parameters through field exploration, sampling and laboratory testing. We are frequently called upon to analyze slope failures and to prepare remedial designs. Our experience includes the design of earth embankment dams and multi-stage retaining embankments for coal refuse impoundments. We are familiar with the design and construction of a broad spectrum of retaining structures ranging from anchored walls and soil nail applications to reinforced soil slopes (RSS) and mechanically stabilized earth (MSE) embankments. As part of the evaluation of failures and their causes, D'Appolonia is frequently called upon to prepare an engineering design to remediate the problem. Some typical examples include design of repairs for failed slopes, redesign of failed retaining walls, design of remedial measures for settled or heaved floor slabs, and design of repairs for failed roads. Structures with below-grade levels require substantial excavations frequently leading to the need for the design of retaining structures/walls to allow construction to proceed in a safe manner. In situations where existing structures abut the construction site, the design of these retaining walls is of great importance, because of the possibility for costly damage to the surrounding structures. D'Appolonia is experienced in the design and construction of anchored retaining walls where disturbance must be kept to a minimum. We have also been called upon in emergency situations to support excavations and underpin structure foundations. We have designed braced excavations and a wide range of retaining walls involving tangent or secant drilled shafts, soldier piles and lagging, drilled-in anchors and soil nails. Our experience includes geotechnical aspects of the design of a subway system in an urban area where existing structures and other infrastructure were major concerns. D’Appolonia is frequently called upon to develop foundation designs at sites where conventional foundation designs or retaining structures cannot be constructed because of unfavorable site subsurface conditions. These conditions might include high ground water levels; thick layers of very compressible soil; thick layers of loose, granular soil; intermittent hard rock and soft, compressible infills associated with karst terrain; or other difficult subsurface condition that prevents the use of conventional technologies. Sometimes a solution can be achieved by improving the strength characteristics of the soils present at the site. Examples include utilizing soil mixing techniques to strengthen fine coal refuse sufficient to serve as highway subbase and consolidation of loose granular soils using dynamic compaction such that spread footings can be supported. Our expertise also includes applications of grouting and construction of deep foundations. We have the expertise to evaluate foundation or retaining structure options and to identify attractive, cost-effective and constructable solutions that meet design requirements. We develop innovative solutions that solve engineering problems while operating within cost constraints. We prepare plans and specifications for our designs and routinely provide monitoring services during construction. D’Appolonia is experienced in identifying the presence of expansive pyritic shales, steel-making slags, pyritic bottom ash, and moisture-sensitive clays and in assessing the potential for related floor or foundation heave. Our technical services have been utilized for school and university facilities, office buildings, industrial plants and parking areas. These projects normally require characterization of expansive materials by visual examination and physical-chemical testing. Physical-chemical testing typically includes soil index testing to determine moisture content and plasticity characteristics; chemical analysis to identify expansive sulfides and oxides; and pH analyses, mineralogical examination, and swell testing. Our staff is experienced in developing site exploration and laboratory analysis programs for identification of potentially expansive materials and in performing related engineering analyses and developing design measures and monitoring programs associated with corrective action. 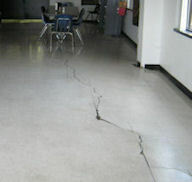 Typical remedial actions may include removal of expansive materials, redesign of foundations, and isolation of expansive materials from air and moisture. Geosynthetic materials have many applications in civil engineering. Geosynthetics are polymeric materials in the form of geotextiles, geogrids, edge drains, drainage composites, erosion control materials, sediment control materials, and geomembranes. 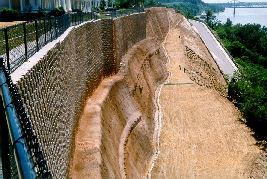 Some applications of geosynthetics include filtration, drainage, temporary and permanent erosion control, sediment control, roadway reinforcement, roadway subgrade improvement, pavement overlays, embankments over soft foundations, mechanically stabilized earth walls, mechanically stabilized earth slopes, and geomembrane-lined containment impoundments and caps. D'Appolonia is experienced in performing analyses that reflect the strength contribution of geosynthetics and in preparing designs for foundations, embankments, pavements, waste containment facilities, channels and erosion and sedimentation control that incorporate geosynthetic materials.